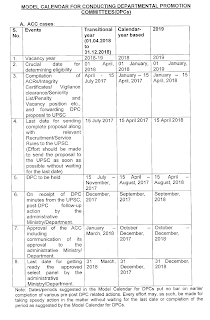 Sub: Procedure to be observed by the Departmental Promotion Committees (DPCs) - Model Calendar for DPCs - Relevant year up to which APARs are to be considered and Model Calendar for conducting DPCs - regarding. 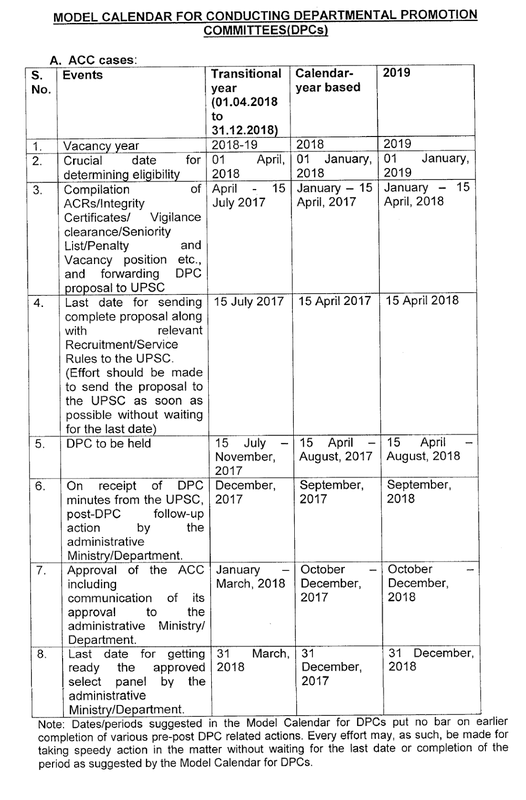 The undersigned is directed to invite reference to the Department of Personnel and Training OM of even number dated 8th September, 1998 prescribing a ‘Model Calendar’ for DPCs in order to ensure that DPCs are convened in advance and approved select panels are ready on the date of commencement of the relevant vacancy year and that the last date for sending complete proposal to the UPSC is 15 July (in ACC cases) and 31 July (in non-ACC cases) of the year preceding the vacancy year. 2. 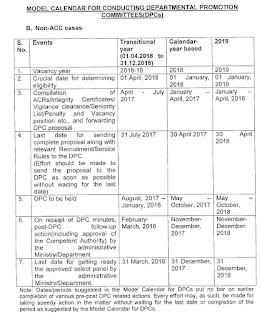 Reference is further invited to the Department of Personnel and Training OM of even number dated 16th June, 2000 wherein it was prescribed/clarified that only such ACRs (now APARs) should be considered which became available during the year immediately preceding the vacancy/panel year irrespective of the date of convening of the DPC. In other words, for the vacancy/panel year 2000-01, it was prescribed that ACRs (now APARs) up to the year 1998-99 (five years preceding T-1st year) are required to be considered. Accordingly, for the vacancy year 2017-18, APARs up to the year 2015-16 are required to be considered. 3. Reference is also invited to the Department of Personnel and Training OM No. 22011/1/2005- Estt(A)-(Pt-II) dated 23rd July, 2009 on the subject ‘Preparation and Maintenance of APARs’ wherein a time schedule for preparation/completion of APAR has been prescribed. As per this schedule, entire APAR process is to be completed by 30th November of the year following the completion of time period of APAR year. 4. As per the extant instructions, say for vacancy year 2017-18, complete proposal to the UPSC has to be sent by 15 July, 2016 (in ACC cases) and 31 July, 2016 (in non-ACC cases) with APARs up to the year 2015-16. However, the entire process of recording APAR for the year 2015-16 is complete by 30th November, 2016 only. After the issue of guidelines regarding time schedule for completion of APAR, the time lines make it practically impossible to make the last APAR (the APAR of the year immediately preceding T-1th year) available for DPCs, i.e., the APAR for the year 2015-16 does not attain finality and thus may not be available before sending proposal for DPC for vacancy year 2017-18. in this background, the instructions regarding the procedure for convening DPCs have been reviewed in consultation with UPSC. (i) The vacancy year may be shifted to Calendar Year from the year 2018 onwards, wherever the financial year based vacancy year being followed now. (ii) The crucial date of eligibility will be 1st of January of the Vacancy year w.e.f 2019. (iii) The APARs for five years preceding T-2nd year may be taken as reckoning APARs, i.e. for the vacancy year 2019 (January 2019 to December, 2019), the reckoning APARs shall be 2016-17, 2015-16, 2014-15, 2013-14 and 2012-13. 6. Ministries/Departments are requested to give wide circulation to these instructions for guidance in the matter and also to ensure strict adherence to the time-schedule prescribed as per the ‘Model Calendar’ for DPCs. I joined Income tax department on 21.02.2017. My probation will complete on 21.02.2019. I have APAR for year 2017-2018. Do our batch is eligible for the promotion to the post of sr.TA from TA in cbdt, according to this model calendar year. 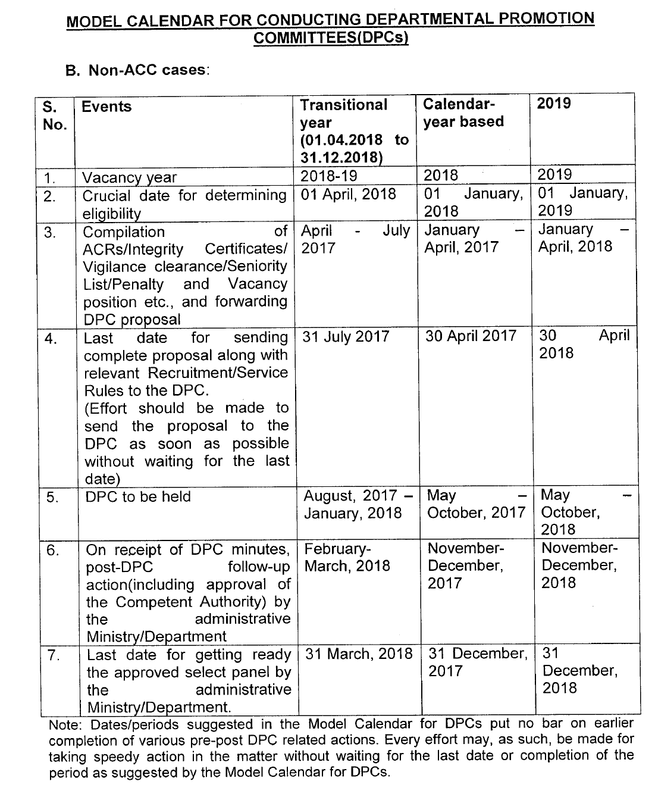 DoPT Order - Procedure to be observed by the Departmental Promotion Committees (DPCs) - Model Calendar for DPCs - Relevant year up to which APARs are to be considered and Model Calendar for conducting DPCs - regarding.